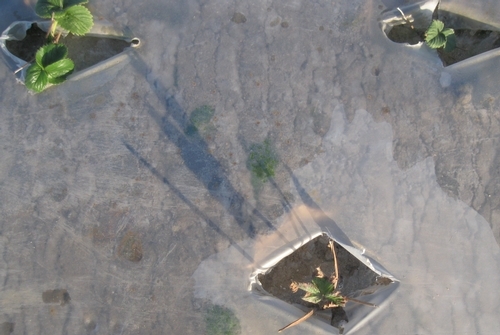 Strawberry plants suffering from salt toxicity. Symptoms include brown and brittle leaf margins (above, photo by Albert Ulrich, UC) and stunted plant growth (below, photo by Stuart Styles, CalPoly). Salinity of the irrigation water depends on the amount of sodium, calcium and magnesium salts. Salinity is measured either as total dissolved solids (TDS) or the electrical conductivity (EC) imparted by the salts. The latter is often considered a better measure of salinity and is expressed as the EC of the irrigation water (ECw) or the EC of the saturated soil extract (ECe). Units of measurement for are milligrams/liter (mg/L) for TDS and decisiemens/meter (dS/m) for EC. Other parameters for soil salinity are pH and the sodium absorption ratio (SAR). SAR is a measurement of sodium absorption compared to calcium and magnesium absorption and is used as an infiltration index. Insufficient leaching of irrigation water in the soil is a major cause of salt accumulation in the root zone. When irrigation is made just to meet the plant needs, salts gradually build up in the root zone. It is important to provide sufficient irrigation so that water will wash the salts away from the root zone. The proportion of water that leaches below the root zone after meeting the crop needs is known as leaching factor (LF). The amount and frequency of irrigation should be calculated appropriately to allow sufficient leaching at the same time avoiding excessive soil moisture which could cause other problems. Compared to the crops grown in hot and dry areas, crops grown in milder climatic areas such as California Central Coast are likely to tolerate higher salinities. Salts in the Central Coast area waters are gypsiferous with calcium and sulfate ions. Waters with such salts do not cause the same level of detrimental effects compared to water with chloride even when they have same ECw. According to Dr. Stuart Styles, Professor of BioResource and Ag Engineering at Cal Poly, ECw (salinity of the irrigation water) is a better indicator than ECe (salinity of the soil) to measure the impact of salinity on strawberry or other crop yields in the Central Coast. There can be up to a 50% reduction in the yield potential of strawberries when the salinity increases from 0.7 to 1.7 ECw (dS/M) with a leaching factor of 15-20%. Maas, E. V. and S. R. Grattan. 1999. Crop yields as affected by salinity. In R. W. Skaggs and J. van Schilfgaarde, eds., Agricultural Drainage. Agron. Monograph 38. ASA, CSSA, SSSA, Madison, WI. Martínez, M. C. and C. E. Alvarez. 1997. 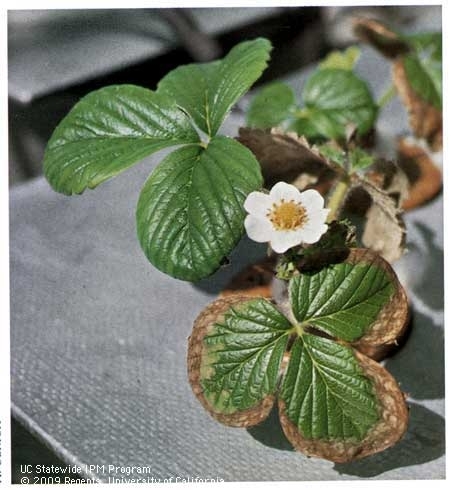 Toxicity symptoms and tolerance of strawberry to salinity in the irrigation water. Scientia Horticulturae 71: 177-188. 2008. IPM for strawberries. UCANR publication 3351.